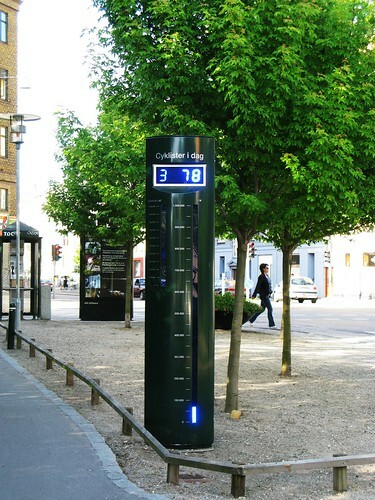 Along the new Green Path [grønne sti] that slices diagonally across Copenhagen and Frederiksberg - a kind of motorway for bikes - the City of Frederiksberg has set up a 'Cykelbarometer' or Bike Counter. It counts the number of cyclists that ride past on the new pathway system each day. 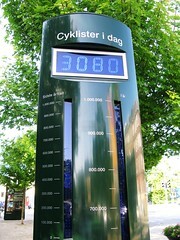 The idea is to encourage more people to ride by showing how many are using it. It is rather new - a month or so - so the total number is only about 70,000. But the counter goes up to 1 million. It'll be fun to see if it gets maxed out. By the way, the sign isn't broken, it's just my camera that couldn't register the diodes. It shows the number of cyclists today at the top, the total number so far this year on the right column and the total last year on the left - once we get there. My son and I use the Green Path to get to football training each Tuesday, but other than that it doesn't really go anywhere I go. I was pleased to see 3000+ cyclists were on it at this spot during the day. In comparison, the road in the background gets about 10,000 cyclists a day. The Green Path is a diagonal shortcut through the city, but it isn't a replacement for the network of bike lanes. It is meant to be a recreational route for cyclists - and pedestrians on the parallel footpath - on a car-free, tree-lined route. Counting parking spaces is a popular activity, too. The sign to the left of the cyclist's head show how many parking spaces are available in various areas of the city centre. The greatest thing about this sign is that it is plainly visible to everyone who rides past, every day, that there are ALWAYS parking spots available. A great argument when the City reclaims parking spots for bike lanes or for planting trees. "Stop whining and look at the signs! There's loads of parking left!"